In this part of the series, I will cover construction of the roof. This is the most complex part of the structure and it required a bit of trial and error to create something workable. There are various options for making a workable roll-off mechanism, but I settled on using V-Groove steel rails and four wheels for mine. For a larger roof, more wheels would be advisable. You can make cheaper mechanisms using large plastic wheels or castors and wooden ‘trench’ rails, but the trenches can retain snow and ice making the roof hard to operate in winter. The steel gate system is designed to support heavy sliding gates so I knew it would stand up to the weight of a small wooden roof. The main challenge was making the rest of the roof structure rigid enough to keep its shape, without making it so heavy as to be hard to lift in to place. I made a pair of beams for the ‘chassis’ of the roof. 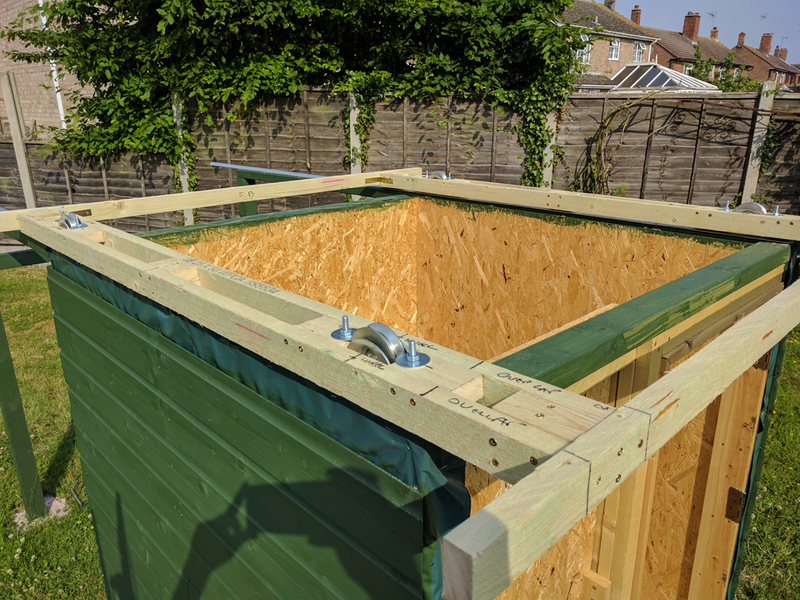 These were constructed out of two pairs of roofing battens cut to length and joined using wooden spacers and long screws at the ends and in the centre. I tried to pick the best pieces of batten with no bends, warps or twists and also ensured each pair were parallel along the full length. 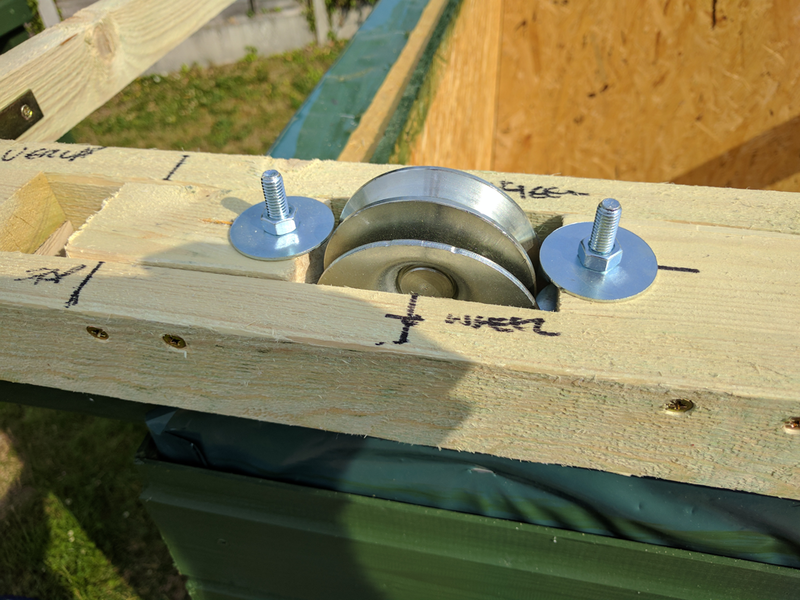 The gap between each pair of battens was just wide enough to accommodate the steel wheels (you will have to adjust the plans to suit whatever you are using for your roof). It is important that the roof overhangs the main structure on all sides when closed, both so that water drips straight to the ground and also to help reduce any wind-blown rain from entering the gap between the walls and roof. Conversely, too much of an overhang would act as a sail and potentially cause the roof to lift in high winds. The steel wheels were mounted so as to sit on the four corners of the main structure when the roof is closed. Again I used wooden spacer blocks to mount them with stainless bolts, nuts and large washers to spread the load over as much of the wood surface as possible. I was able to adjust the height of the roof later by adding or removing nuts between the top of the wheel bodies and the washer on the underside of the wooden spacer blocks. This allowed me to fine tune the roof height so that it ran freely without snagging the walls, whilst minimising the open gap between the roof and walls. The next job was to start fitting the steel roof rails. These were easily secured to the wooden roof runners by means of the screw slots pre-drilled along their length. I first positioned both rails and secured each of them with a single screw at one end. I then made two cross-beams for the roof chassis which were the width of the observatory plus the desired overhangs at each side. 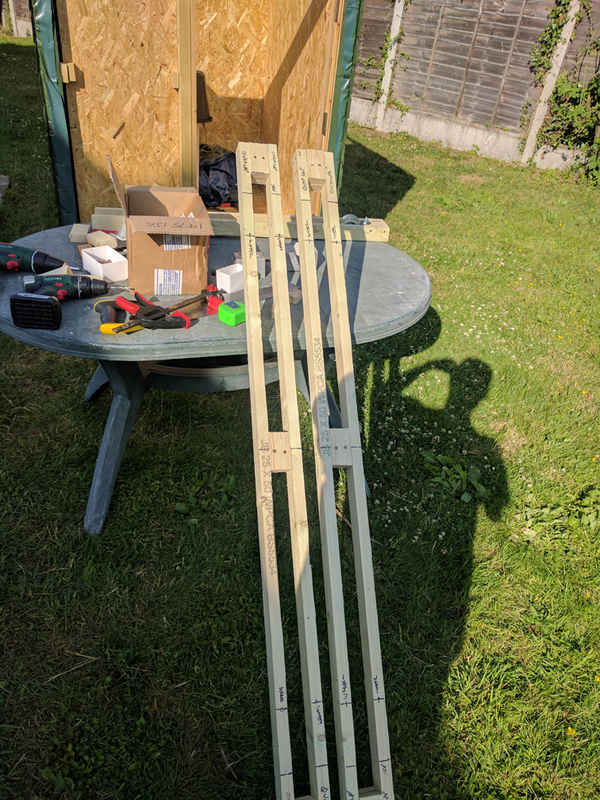 Next I balanced the two roof chassis beams on the rails, measured the width between them and screwed one of the cross beams to the ends of the chassis in the appropriate position, ensuring that everything was as square and level as possible in all directions. I then attached the second cross beam at the other end of the chassis, using a carpenter’s square to ensure that all four corners were as square as possible. Now that I had a reasonably square ‘carriage’ with wheels at each corner, I ran it down the rails to the ‘roof open’ position the far end of the rails. 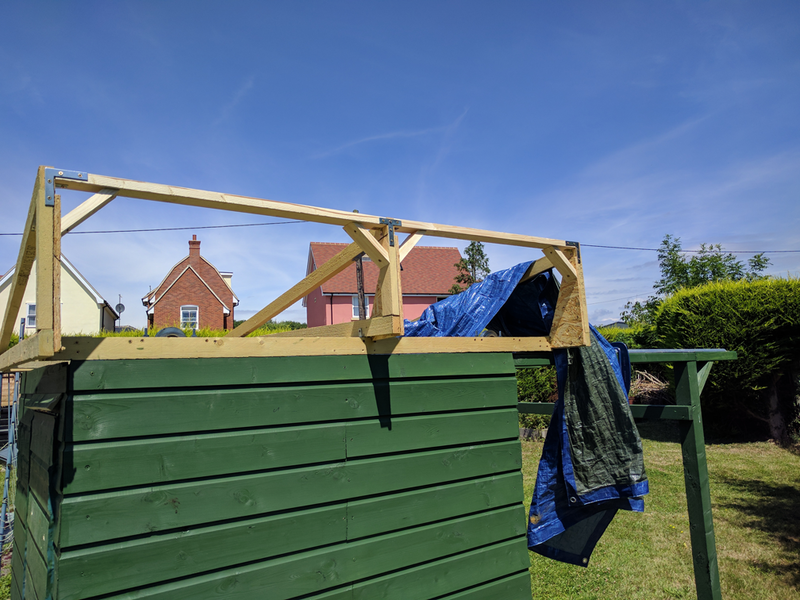 I then secured the other ends of the (now parallel) steel rails with two more screws and tested everything to ensure that the roof would run reliably. 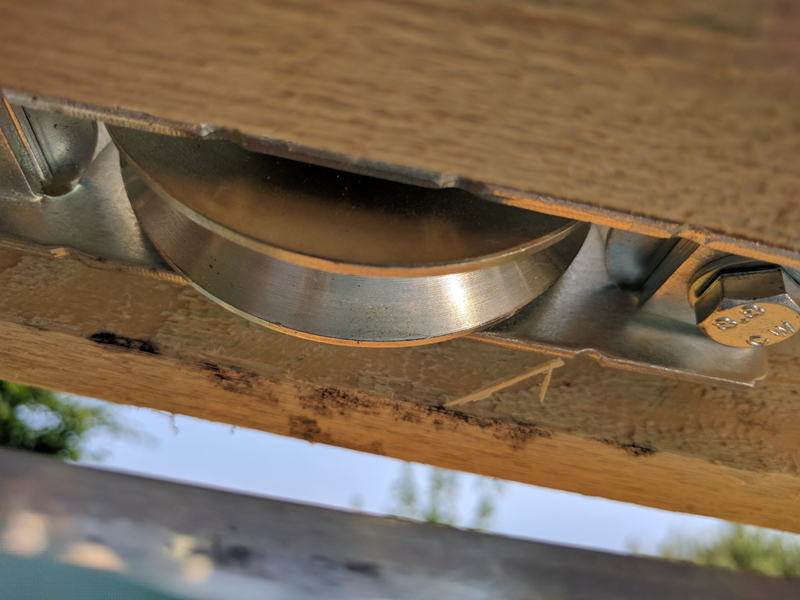 I found that I needed to use some fibre washers as shims between the top of the roof runners and the bottom of the rails where there were slight warps in one or the other. Once I was happy with the mechanism, I screwed the rails in to place along their full length. 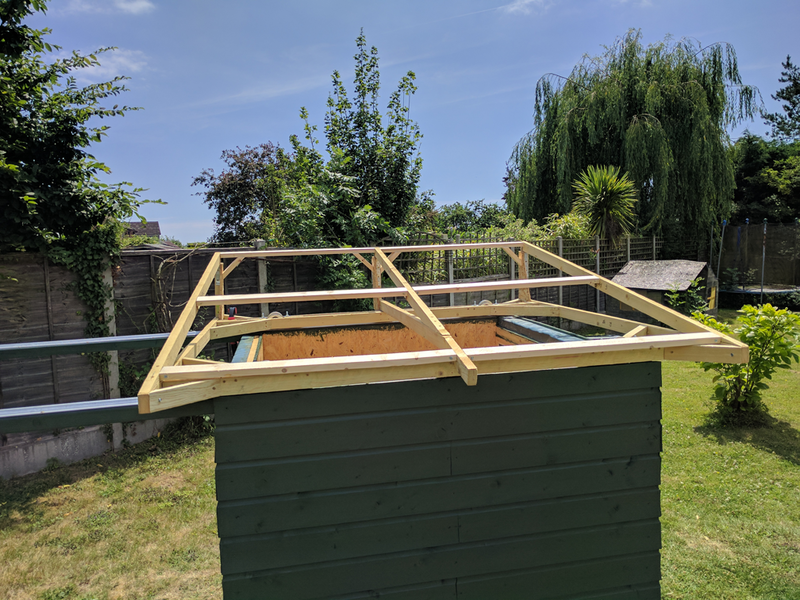 I now made up the rest of the roof frame. This was definitely a case of trial and error! I settled on a pent roof design with an eleven degree slope which seemed to be the minimum recommended for this type of roof. The pent design reduces the number of pieces and angles to be cut, as well as making it easier to seal the peak of the roof. I first fitted corner braces inside the roof chassis to prevent twisting, plus further braces between the outside of the main chassis beams and the cross-beam overhangs. I next fitted a third cross beam on top of the roof chassis across the centre overhanging on the ‘tall’ side of the pent. Next I made the vertical pieces which I reinforced with triangular braces cut from OSB. I then added further beams to form the sloped upper part of the roof, plus some additional corner-bracing to keep the upper part rigid. I found it necessary to use a small number of angle, corner and T-brackets during assembly of this part of the roof. Finally I added a couple of short extension pieces to the ends of the central cross-beam to ensure the bottom and outside edges of the roof line would be square with the corners when clad. At this point the roof frame was still a one-person lift on and off the rails, but from here on out you will either need to assemble the rest of the roof in-situ as I did, or procure some assistance if the roof is too large for you to reach the centre and thus requires assembly on the ground. I made up an internal ceiling from 11mm OSB sheet. This was made in two halves so that it could be slotted in with the top frame already in place. The ceiling was screwed to the top of roof chassis around the outside. The central edges of the ceiling butted up against the central cross beam. I screwed three short lengths of roof batten across the underside of the ceiling and central beam to prevent it sagging in the middle. This was OK due to the short span of the roof, but you might need more substantial bracing if your roof covers a larger area, or perhaps consider making the ceiling in one piece. I placed a layer of 25mm polystyrene sheet on top of the ceiling for insulation and then stapled vapour barrier membrane over the insulation to keep damp out of the observatory. The roof itself was covered in clear 80mm corrugated PVC sheet. This is cheap and lightweight, and should not need renewing or repair as frequently as a wooden roof clad in roofing felt. 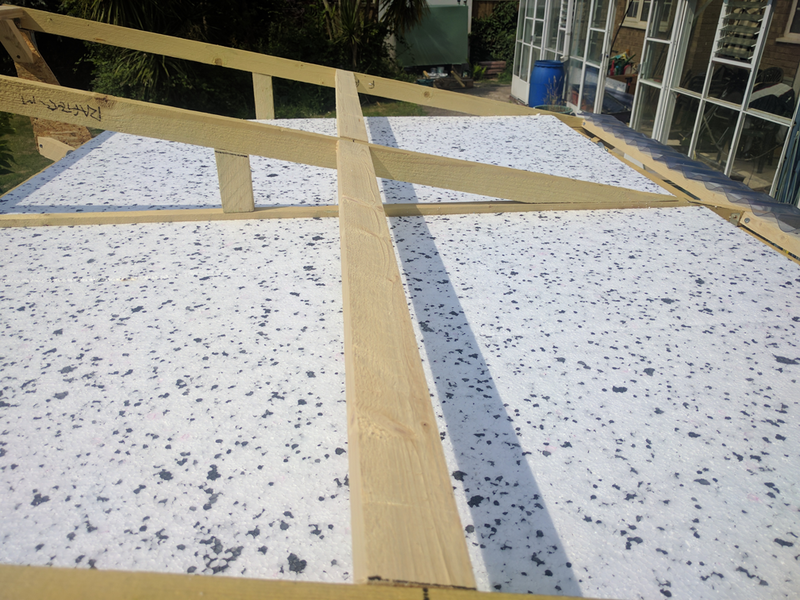 I used two 3,000mm x 660mm sheets which were cut to make two pieces which covered the full slope of the roof, with the two off-cuts spanning the central gap. At both ends of the slope I used corrugated PVC flashing to seal the corrugations. This would normally be fitted on to the wall of a house, but by inverting it and leaving the flat part of the flashing hanging over the edges of the roof it created an effective seal to the cladding. The key point is to ensure that any sheets/flashing higher up the slope of the roof sit on top of sheets/flashing lower down. This ensures that water drains off the roof rather than running in to the gaps at the joints and getting in to the roof space. Similarly, overlapping at least two corrugations at joints across the width of the roof will keep the water out. 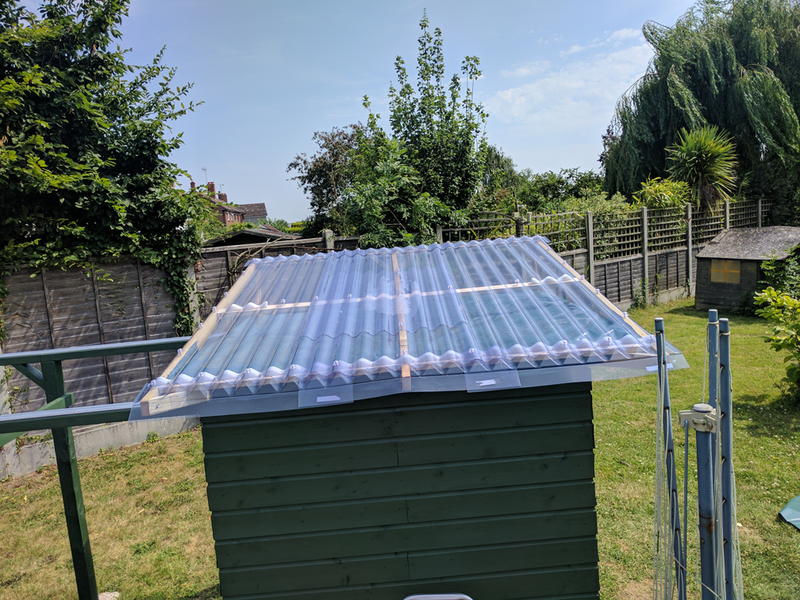 I used foam inserts between the horizontal battens and the corrugated sheet to minimise any noise caused by the roof flexing in the wind. 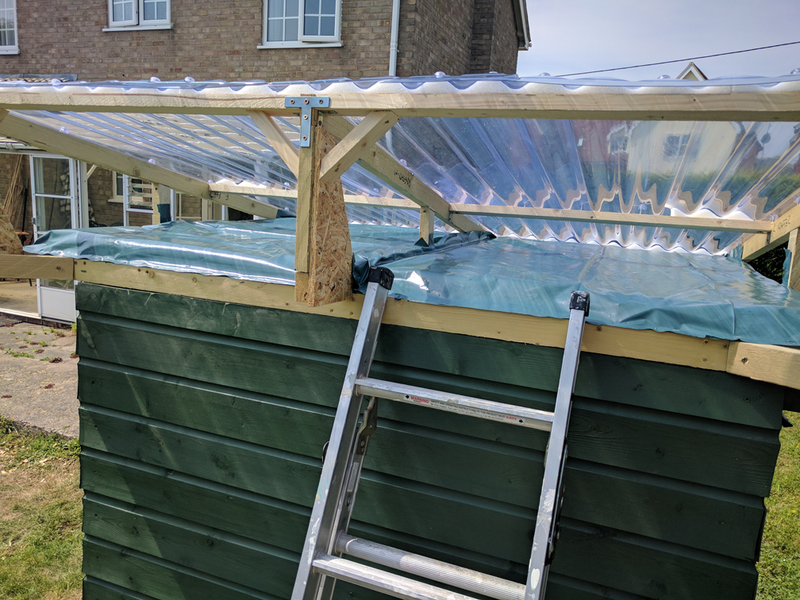 The sheeting was secured using the correct PVC roof fixing screws, which are supplied with washer and cap sets to keep water out of the holes. Drill the holes in the peaks of the corrugations, not the troughs, to avoid water ingress. Cutting the sheet is difficult as it tends to split and crack at the slightest provocation. I found that a Dremel multi-tool with a fibreglass cutting disk worked very well, as it tended to melt the plastic in neat(ish) cuts rather than splitting it like a saw blade would. Drilling screw holes is also a bit of a challenge, but I found a sharp wood bit on a low speed worked, ensuring to let the bit cut rather than forcing it through the sheet. The final step was to clad all sides of the roof in treated shiplap. This was attached horizontally to the long edges of the roof, lower than the level of the roof runners. 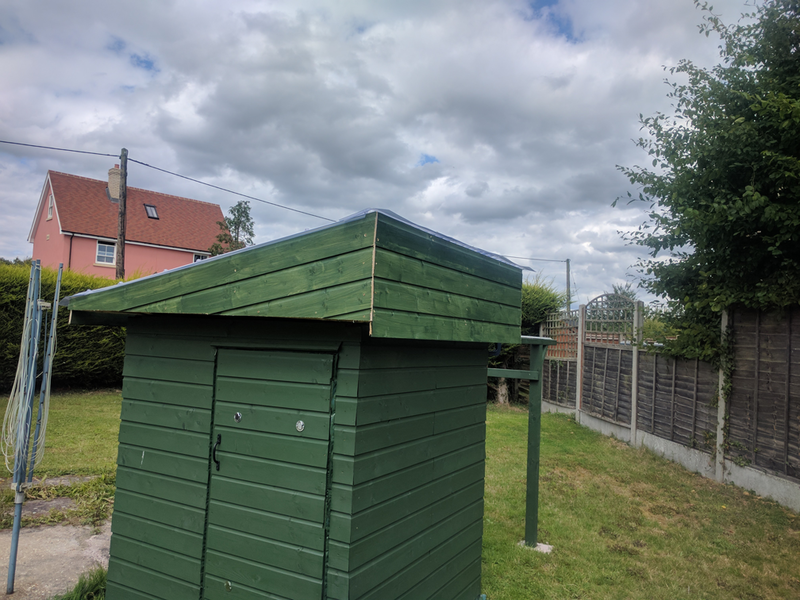 I found that fitting it to match the eleven degree slope of the roof at the sides was easier and gave a pleasing finish, of course ensuring that it cleared the walls at both ends. The last thing was to check that the roof would still run true under the additional weight of the ceiling and cladding. A few minor adjustments to the height and squaring of the roof proved necessary, but nothing that required the roof to be removed or disassembled. In the final installment of this series, I’ll be covering a few finishing touches to the observatory, but you’ll be pleased to hear that the hard work is over! As you undoubtedly are aware, the Imaging Toolbox is not working (Error404), at least on my machine. I find the Toolbox essential in planning every imaging session I do. I sincerely hope this is just a glitch and that your useful creation will return ASAP. I am aware, hopefully it will be up and running again by Monday at the latest, possibly sooner. The problem is due to the CDS removing support for https from their services unexpectedly which the toolbox relies upon. I have found a work-around and am in the process of implementing it. Should now be fixed. You may need to clear your browser cache to get it going first time. Yes! The Imaging Toolbox is working again! Thank you so much for creating and maintaining this valuable resource. There is nothing else available that even comes close to its usefulness.